Bookended by a pair of getaways, "Drive" is a gorgeous, hyper-cool, ultra-violent character study of a man whose purity and principles are ultimately his undoing. Gosling stars a Driver, a Hollywood stunt driver by day who moonlights as a getaway man, both of his careers managed by his mentor Shannon (Bryan Cranston), who hopes to turn his protégé into a stock car racer—"Put this kid behind a wheel, there's nothing he can't do." Not surprisingly, those dreams are derailed. By chance, Driver meets his new neighbor, Irene (Carey Mulligan), when her car breaks down, and the chemistry between the two is immediate, but things are complicated by the fact that her husband, Standard Guzman (Oscar Isaacs), is about to get out of jail. Upon his release, Standard recruits Driver for a heist, a job that goes sideways in a hail of bullets and leaves Driver holding the bag, literally. Gosling continues to show more range than just about any young actor in Hollywood. Coming of his turn as a ladies man in "Crazy, Stupid, Love," in "Drive" Gosling turns inward as a man of few words, with no name or past, who only wants to keep doing the one thing he does well, drive. Despite a scarcity of dialogue and a character who doesn't (can't?) 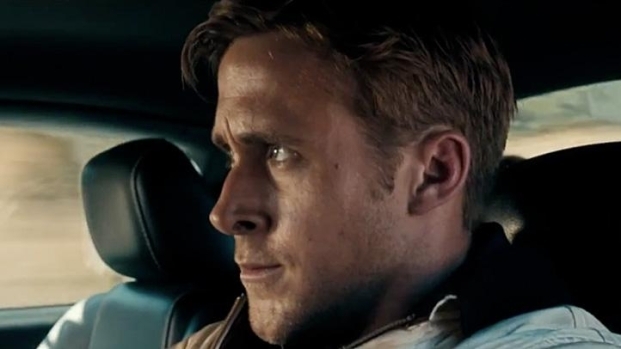 emote for the first 45 minutes, Gosling brings an intensity to Driver that commands your attention and makes his shocking transformation from laconic wheelman to single-minded killing machine believable. Ryan Gosling stars as a stunt driver who moonlights as a getaway driver in this new crime thriller from director Nicholas Winding Refn based on the novel by James Sallis. Co-starring Carey Mulligan , Albert Brooks, Ron Perlman, Bryan Cranston and Christina Hendricks, the film opens Sept. 16. But the man enjoying all of the early Oscar buzz is Albert Brooks, here cast against type as a hard-boiled New York gangster trying to make his name in LA. Who'd've guessed that the manic nebbish of "Lost in America" could portray such a cold-blooded shark? The film opens with Driver behind the wheel following a hold-up, as he rolls through the streets of LA, a Clippers-Raptors game on the radio, trying to avoid the cops. Refn is in complete control throughout the film, hitting the gas and the breaks at the perfect moments, his framing is stunning, the colors as rich as they are dark. "Drive" is the kind of film that makes fans of '70s cinema gush—it's a clinic in minimalism from Refn and his cast, a shining example of much can more can be conveyed with less. Refn has been teasing the press with talk of a sequel, leaving us to wonder if tickets are available yet.